GeekTonic: Satellite TV PC Tuner Card On It's Way? Satellite TV PC Tuner Card On It's Way? Earl Bonovich at DBSTalk has the scoop on what is likely the biggest HTPC news out of the Vegas CES show to date. DirecTV is showing off their new HDPC-20, a new dual tuner device that connects via USB to your PC and allows your PC to tune, record and viewing of Satellite TV right from your Home Theater PC! It only references Windows Vista Media Center, but hopefully support for the other HTPC software programs such as SageTV and Beyond TV wouldn't be too far behind. 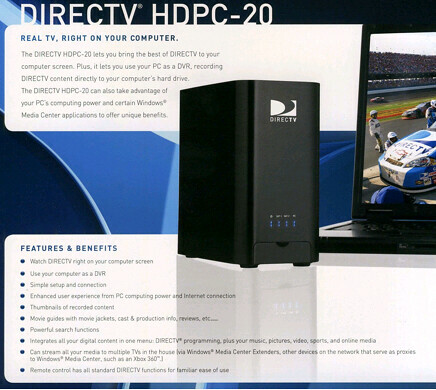 Here is a scan of the brochure available in the DirectTV CES display provided from a forum member at DBSTalk. But yes, this is a very real product...... hopefully soon after CES, I can get some solid estimated time frames on when they will hit the streets. On another CES/HTPC note, here might be some new information out of CES on SageTV regarding Echostar as well, but haven't confirmed it yet - hopefully by the end of today I'll have a better idea.